You’ve heard this from me before – this ‘tip’ or ‘step’ should really take place before you start your home search process! Getting pre-approved is one of many steps that will show home sellers that you are serious about buying, and will allow you to make your offer with the confidence of knowing that you have already been approved for a mortgage for that amount. You’ll also need to know if you are prepared to make any repairs or updates that may need to be made to the house (ex: new flooring, updated master bath). Make sure that as soon as you decide that you want to make an offer, you let me know so I can get it written up and presented asap, so we have the best chance at getting you that home! Talk with me about ways we can make your offer stand out in this competitive market! Of course, offer price is paramount, but there are many other parts of an offer that might make a difference to a seller and might cause your offer to be chosen above any others. Once you want to make an offer, I’ll call the listing agent and ask point-blank if there’s anything that the sellers need or want that we could provide…that kind of conversation that might provide some “inside information” can make a huge difference! My advice with these counterpoints, is simple – don’t sweat the small stuff. If the counter points are reasonable and aren’t deal-breakers, agree to them and get that house under contract asap! At any point up until all point of an offer are agreed to, and that offer becomes an “executed” contract, another buyer can come in, make an offer, and get that house under contract. So, be prepared to make quick decisions on counterpoints, and get that home! Whether you’re buying your first home or your fifth, having a local professional on your side who is an expert in their market is your best bet in making sure the process goes smoothly. Let me be that expert to help you out. Call or text me at 214-549-7978 and let’s do some HAPPY HOUSE HUNTING together! Calculator for Buyers: Purchase Now or Save More? A consumer has saved $10,000 of the $40,000 needed for a 20 percent down payment. She can add about $6,000 a year in savings to that. She wants to purchase a $200,000 home. The calculator allows her to see the cost of the home purchase if she did a 3 percent or 5 percent down payment. The calculator also shows that if homes prices appreciate, say, at 3 percent annually, the amount she’d need for a 20 percent down payment would be $48,552, and she would need more than 6 years of savings before she could buy. During that time, she will have paid more than $80,000 in rent, while her home equity position would be more than $72,000 had she bought six years ago. None of this is meant to encourage prospective borrowers to buy a home before they are ready. It is in everyone’s best interest for borrowers to succeed, so borrowers need to be comfortable not only with the mortgage payment but also the other responsibilities that come with homeownership. I tell my buyers when we first meet – knowledge is power when you’re looking to buy a home. Do your research, don’t ever hesitate to ask questions – of me or of the lender or of the title company – we’re all a team that needs to work together to make our buyer clients feel comfortable and knowledgeable about the home buying process. A calculator like this one that will show you the potential costs of waiting to buy a home versus buying a home now with a lower down payment could be a great first step in building your knowledge base to buy that home! Questions? 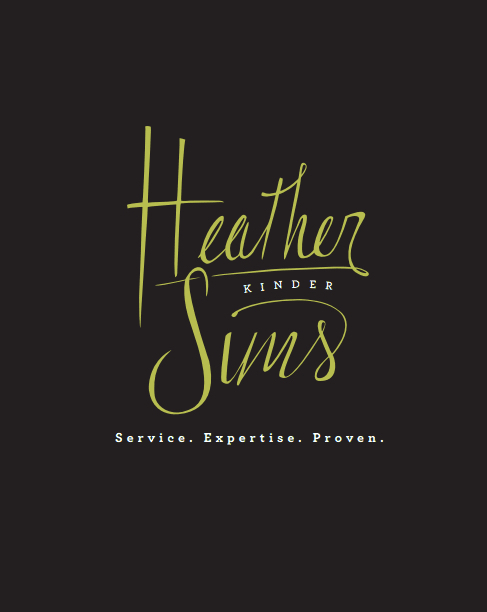 Give me a call, shoot me a text or email…I’m ready, willing, and able to help! And CNBC says consumer confidence in the economy is fueling the market: “U.S. home resales surged to a 10-year high in January 2017 as buyers shrugged off higher prices and mortgage rates, a sign of growing confidence in the economy.” The only challenge to the market is a severe lack of inventory. A balanced market would have a full six-month supply of homes for sale. Currently, there is less than a four-month supply of inventory nationally. This represents a decrease in supply of 7.1% from the same time last year. This inventory supply is even lower in the Dallas area because of our economic and job growth sectors…so many people are wanting to move into this area and there are just not enough home options for them. What does this mean? Well, one of my listings this month didn’t just have “multiple offers” – it had 20! This is what we’re seeing for well-priced home listings in the Dallas area, at least those in the $300,000 and less categories. With demand increasing and supply dropping, this may be the perfect time to get the best price for your home for years to come. Let’s get together and discuss the inventory levels in your neighborhood to determine your next steps! Most people don’t buy a new home on a whim. Chances are you’ve been dreaming about your new house for months or even years. After hours of browsing beautiful homes on Realtor.com, Houzz, Pinterest, etc. or viewing a few open houses, you can now picture your perfect house down to the smallest detail whether that house is a sprawling ranch on a nice-sized piece of land or a high-rise condo smack in the middle of downtown. That’s great! It’s good to know what you want, but it’s even more important to know what you need. The first step is to get pre-approved for a mortgage so you know what kind of budget you’re working with. You don’t want to fall in love with the ‘perfect’ house only for it to be way outside of what you can afford. Now take that mental image of your perfect house and start to break it down. What is a non-negotiable about it? Think about needs in terms of absolute. It needs to have a roof, walls, a kitchen, a bathroom. What does else this house need to be functional for you? Does it need to be a short commute from work? Does it need four bedrooms? Does it need to be wheelchair accessible? Pay attention to when you use the phrase “would be nice.” “It would be nice to have a large backyard,” or, “A two-car garage would be nice.” This is a telling sign that these features should be put on the ‘want’ list. Sitting down with a realtor (like me!) can make this process easier. They should know how much your ‘want’ features can add to the price of a house so you can know what you might be able to realistically find within your budget. Prioritizing wants: does it add value? In real estate terms, these are features that most people consider useful, safe, or convenient. This could include granite counter tops, hardwood floors, a beautiful view, a good school district, energy-efficient windows, land, or nice landscaping. These are features that will add value for future homebuyers. Deciding whether a ‘want’ is a value-added item can help determine which wants to prioritize. Maybe you would love a reading nook and granite countertops. While not everyone will value a spot specifically made for reading, most homebuyers will value gorgeous countertops. Sliding granite countertops to the top of the wants list can help ensure that in the future when you go to sell, your house will sell quickly. Wrap your mind around your non-negotiables by writing it down and get your realtor on the same page as you. This is where a checklist can come in handy. If you’re ready to starting figuring out what you new home needs, you can save my free Must-Haves versus Maybe-Wants included below! And if you’re ready to make list like this, you’re ready to contact a realtor…I’m hoping that’s me. Let me buy you some coffee and let’s talk about the wants and needs you have for your next home! Crazy might be a strong word, but it fits in this case, because if you’ve been on the fence about selling your home, it doesn’t get much better than this. Two key factors in home selling – PRICE and TIME – are perfectly aligned right now to make it a GREAT time to sell. As for price, he market in the Dallas area has been strong and remains strong going into 2017. The National Association of Realtors (NAR) reinforces that now is a great time to make a move AND make a mint off your home sale with this new stat…homeowners who sold in 2016 saw an average home price gain since purchase of $38,206 – or a 21 percent, on average. That’s up from an average 13 percent gain in 2015, and it is the highest increase since 2007. WOW! The three months in the second quarter of the year (represented in red) are consistently the most popular months for sellers to list their homes on the market. Last year, the number of homes available for sale in January was 1,820,000.That number spiked to 2,140,000 by May! What does this mean to you? With the national job situation improving, and mortgage interest rates projected to rise later in the year, buyers are not waiting until the spring; they are out looking for a home right now. If you are looking to sell this year, waiting until the spring to list your home means you will have the greatest competition for a buyer. Has your home value increased that much and is now the time to sell? You won’t know until you meet with a professional realtor (i.e., ME). Call me, text me, email me, send a carrier pigeon to me with a note (I’ll give you my address), just get in touch if you’re curious about the value of your house and what kind of timing is best. I’m happy to help answer these and any other market, timing, etc. questions for you! Of course, this “mission statement” is a bit silly (what do you expect from Modern Family, right?) and was definitely written with humor in mind, but the themes of helping someone achieve the American Dream and putting a client’s needs above your own are not to be taken lightly. If a Realtor seems to be putting things like the commission they may earn, the opinion they may have about the house or neighborhood, the number of homes you’ve viewed first, before your wants and needs as a buyer, that’s a concern you should bring to their attention right away! When you make the decision to enter the housing market, as either a buyer or a seller, make sure you look for an agent who exemplifies these values and will help you through every step of the process. Someone who is working with you to find you a home or to sell your house should be primarily concerned with what’s best for you, not for themselves. What does that look like in the real world? Well, if you’re in the Dallas area, give me a call and let me show you! Whether you are buying or selling a home, it can be quite an adventurous journey; you need an experienced real estate professional to lead you to your ultimate goal. In this world of instant gratification and internet searches, many sellers think that t hey can For Sale by Owner or FSBO. The state of Texas has different regulations regarding the contracts required for a successful sale, and these regulations are constantly changing. A true real estate professional like me can guide you through the stacks of paperwork necessary to make your dream a reality. Another reason to make sure the paperwork is right is for your protection. From the seller side, would you know what you would have to disclose to buyers about the home, what has happened in the home, what is happening around the home, etc.? From the buyer side, what rights to you have to specific information before and after the sale? These are very important, and potentially very costly, issues! According to the Orlando Regional REALTOR Association, there are over 230 possible actions that need to take place during every successful real estate transaction. Don’t you want someone who has guided people through those steps numerous times before, someone who knows what these actions are and can explain them in a clear and concise way, to make sure that you acquire your dream? So maybe you’re not convinced that you need an agent like me to help you sell your home because the market is just so hot. However, after looking at the list of parties that you need to be prepared to negotiate with, you’ll realize the value in selecting a good realtor. From the buyer – who wants the best deal possible and likely has an agent who you most likely will be responsible for paying – to the home inspection companies, to the appraiser, to the title company, there are at least 11 different people that you will have to be knowledgeable with and answer to, during the process. For sellers, it is important for your home to be priced correctly from the start to attract the right buyers and shorten the time that it’s on the market. You need someone who is not emotionally connected to your home to give you the truth as to your home’s value. Also, contrary to way may be popular belief, sellers make more money when they hire a realtor…according to the National Association of REALTORS, “the typical FSBO home sold for $185,000 compared to $245,000 among agent-assisted home sales.” For buyers, you don’t want to pay more for a home than it’s really worth, which is a big cause for concern in a hot market like this, and you need an agent to help you run the numbers and determine that. Just like you probably have your finger on the pulse of what’s going on in the industry in which you work, a good realtor like me knows what’s going on in real estate. There is so much information – and misinformation – out there on the news, the internet, and these home shows on networks like TLC. Home sales, prices, and mortgage rates; how do you know what’s really going on and how the market works specifically in the Dallas area? Do you want to trust your own limited knowledge about real estate to buy or sell the biggest asset you’ll probably every buy or sell, or should you call an expert like me to help? Hiring an agent will make your buying or selling experience an educated one, and you can be more assured that you will be making decisions based on real knowledge that will lead to success. You wouldn’t replace the engine in your car without a trusted mechanic, you wouldn’t perform your own surgery, and you wouldn’t build your own house brick-by-brick without being qualified in one of those fields. Why would you make one of the most important financial decisions of your life without hiring an expert in the field of buying and selling real estate? Considering a move, get in touch with me and let’s talk! Ah, the crisp smell of fall is in the air, the leaves are bursting into brilliant color, kids are back in school, and it might be the right time for your to considering selling your house. Conventional wisdom says to list your home in the spring, but is that the right choice this year? Here are a few facts to consider that might sway you to sell during the autumn season. 1. There’s less competition in the market. The traditional time to list a family house is in the spring when the flowers are beginning to bloom and families are looking to move before summer vacation takes hold, but the mild temperature of autumn, beautiful orange and gold leaves, and less competition on the real estate market can make it easier to make a home an enticing find to prospective buyers. 2. Demand is still strong. The negative equity situation in previous years has trapped many families in their homes and caused them to stay put, but since real estate prices have been climbing in recent years, there’s a renewed desire for many homeowners to sell. This means means that many homes will be coming to the market in the spring and summer months. Additionally, now that builders have more confidence in the market, new single-family homes will be coming on the market so the choices buyers have will continue to increase. 4. Buyers can take advantage of tax breaks. Property tax and mortgage interest are both deductions you can tax on your taxes for the whole year, even a buyer closes on a property in December. This is worth thinking about and just sweetens the deal for prospective buyers. Another tax advantage is for buyers who can close on a house before January 1st – that is that they’re able to file for homestead exemption. So, not only is this good for sellers as an advertisement for buyers who might want to buy their home before the new year, it is equally good for sellers who are also buying a home! 5. And it’s a GREAT time for you to upgrade. Home prices will continue to rise and if you’re planning on moving into a bigger house, now is the time to do so before prices appreciate. Rates are forecasted to increase in 2017, AND house prices are projected to go up a whopping 5.3% over the next year. Lower rates and lower prices give you more buying power. Selling your home now will put you in perfect place to upgrade to a newer, larger home before these increases. If you think that selling your home this fall might be the right choice for you and your family, get in touch with me today. I’d love to take you for a nice fall-flavored pumpkin spice latte and give you a free home estimate as we have our coffee talk! Can Rates Stay This Low?? Of course there are a lot of factors to consider when trying to decide whether to make a move – job security, location, savings, etc. But the interest rate you pay on your home mortgage has a direct impact on your monthly payment…the higher the rate, the greater your payment will be. That is why it is important to look at where the experts believe rates are headed when you’re deciding to buy now or wait until next year. I keep saying to people who ask that these rates can’t stay low forever – they eventually have to go up. I actually thought they would this past summer, but with the Euro issue in Europe and the election here in the U.S., I think the powers-that-be decided that they couldn’t raise rates. The 30-year fixed mortgage rate has actually fallen half a percentage point since the beginning of the year and has remained at or below 3.5% for the last 11 weeks, according to Freddie Mac’s Primary Mortgage Market Survey. 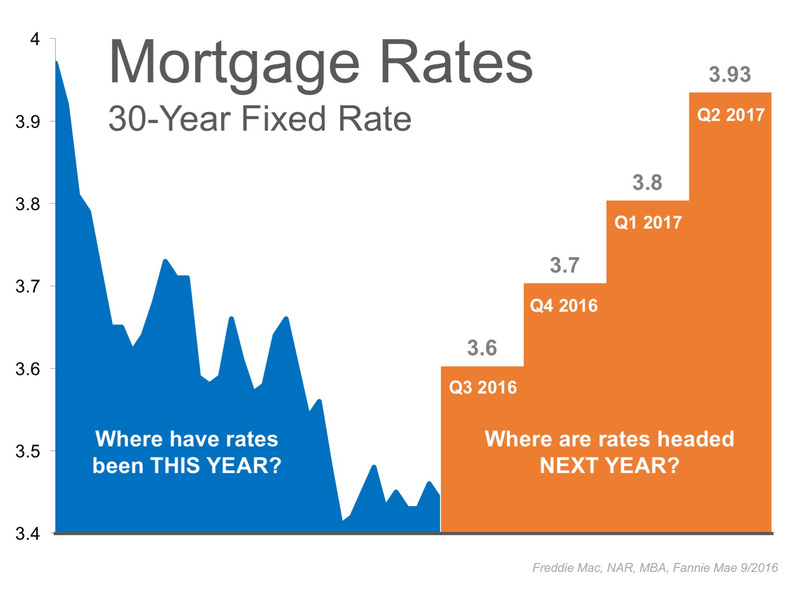 The chart below shows how far rates have fallen this year (on the left in blue), and uses an average of the projections from Freddie Mac,Fannie Mae, the Mortgage Bankers Association and National Association of Realtors (on the right in orange). As you can see, interest rates are projected to increase steadily over the course of the next 12 months. Even a small increase in interest rate can impact your ability to buy the home you want. With rates being what they are today, you have a lot of buying power to get the home you really want! If you have any interest in buying a home, let’s talk, because now might be the perfect time.